For me, some things beg to be photographed. Like this tree. It was late afternoon and my daughters and I were headed to Lake Martin to take a few pics before the sun went down. Late afternoon is my favorite time of day because of the beautiful glow that the sun casts on everything as it makes its way down to the horizon. 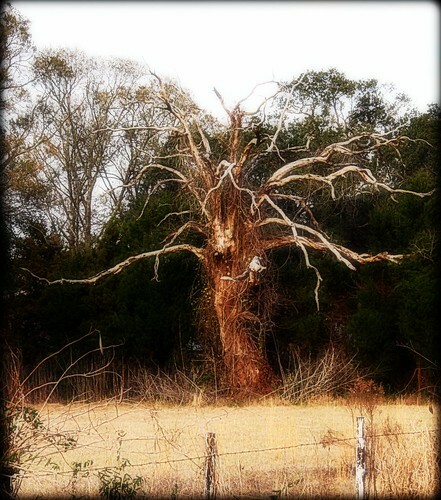 As we drove by a field that we have driven by numerous times, I noticed this tree. Perhaps it stood out because it is apparently dead, as opposed to those trees around it. All I know is that it seemed to reach out to me, like those trees that come to life in the Wizard of Oz. So I pulled off the highway as much as possible, turned on the safety flashers, and got out of the car. I took what photos I could without getting run over by oncoming traffic. My adventure was cut short when the puppy that lived across the highway decided to come after me. I was afraid he would enter the highway and get hit by a car, so I got him home safely, got back into the car and headed for the lake. I've processed the photo a bit to give the tree the prominence it deserves. Judging by the vines that cover it, it may be host to wisteria or trumpet vines in the Spring. I'll definitely be visiting it again. I know stuff. I like to learn stuff. I like to make stuff.